Little Tikes products are known for providing durable, imaginative and active fun. Products are manufactured in a wide variety of categories for young children, including infant toys, popular sports, play trucks, ride-on toys, sandboxes, activity gyms and climbers, slides, pre-school development, role-play toys, creative arts and juvenile furniture. The red and yellow Cozy Coupe® Car, an international icon in toys, celebrated its 25th anniversary in 2004, with more than 6 million units sold since its creation. A Twist on the Little Tikes Cozy Coupe® Car; the Cozy Truck™ is a roomy pickup truck and is the perfect ride for hard-working kids! There are some brands that, as a parent, you come to know and trust. Little Tikes is one of those brands in our home. If you were to enter our playroom, or scan our backyard it's clearly visible which toys are durable and which aren't. Many of our Little Tikes toys have withstood years and years of rigorous play, and still have MANY years worth of play left in them, still! We recently had a chance to check out a new twist on an old favorite; the Little Tikes Cozy Truck! Spacious, and packed with features, I knew immediately that this toy held the potential to become a fast favorite. We love the friendly inviting face on the "grill" of the Cozy Truck, it's just so darn cute! The princess enjoys packing up the flatbed with her stuffed animals and taking them for a quick zip down the back path in our yard (the slight decline allows for her to gain slight momentum which invokes some serious laughter from the chickie as she cruises down the path!). The working horn (battery operated), open/close "gas cap", and built in handle in the roof (allowing parents to push younger children easily without having to bend or stoop) all help to make the Cozy Truck the ultimate Spring/Summer active imaginative toy for children 1 1/2 yrs - 5 yrs old. For endless hours of imaginative play this Spring / Summer from a brand that parents have come to know and trust, check out the Little Tikes Cozie Truck! You can find the Little Tikes Cozy Truck™ at a retailer near you, and online at http://www.littletikes.com/ . Fun in the Sun! 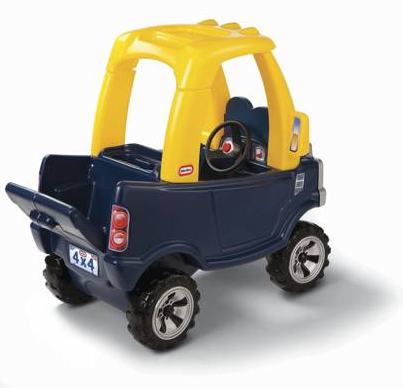 One Lucky Reader will receive a Little Tikes Cozy Truck™ (RV $79.99)! Leave a comment~Visit http://www.littletikes.com/ and let me know which item from their New Arrivals Section you would love to have for your litle one this season. The comment is considered your entry. Entry to this giveaway ends at 12pm PST April 28, 2011. Winner's are chosen randomly through random.org. Winner's may not have won a previous Enjoy Lighting Giveaway. The winner will be announced in a post within 7 days of the giveaway ending, and contacted through email. The winner will have 48 hrs. to respond or another winner will be chosen. Both my kids would enjoy playing in the Secret Garden Playhouse. My son would absolutely love that truck though! I follow and would love the slam n' curve slide, looks like fun! #1, I entered your Samsung Blu-ray giveaway. #2, I entered your Samsung Blu-ray giveaway. #3, I entered your Samsung Blu-ray giveaway. #4, I entered your Samsung Blu-ray giveaway. #5, I entered your Samsung Blu-ray giveaway. Well hello there! This is a very fun giveaway you are hosting, and I'm very happy to be apart of it. 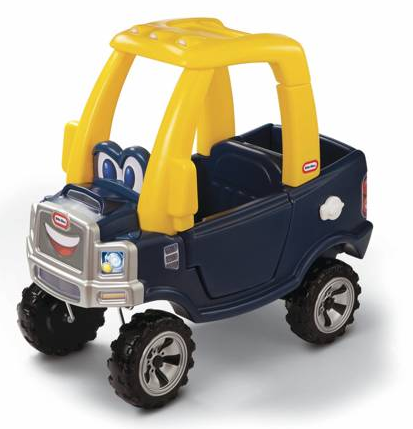 I'm following you on Twitter as @GrMaCC, and I would love to have this Little Tikes and The Cozy Truck™ for my grandson! I'd love to try the Cozy Coupe® 30th Anniversary with Trailer - so cute!